Was most recently occupied by Jeffrey Owen Jones, Bob Dylans’ Mr. Jones from his song Ballad of a Thin Man – “Because something is happening here/But you don’t know what it is/Do you, Mister Jones?” Read Jones’ obituary by Democrat& Chronicle’s Jeff Spevak here. Read NME’s obituary here. 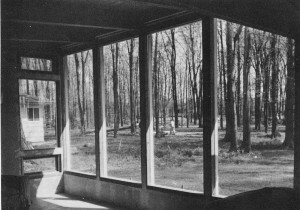 The construction photograph below shows the simple “T-beam” system (built-up wood beams, with tongue and groove planks on top of them for roofs and ceilings) which architect Don Hershey worked out to allow a great deal of owner work by his clients the Browns on a house described on the next two pages. 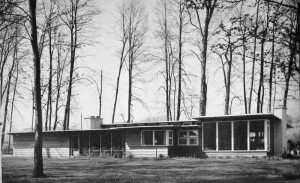 Cost Facts: $15,398 for house in 1950-1951; garage-workshop and summer living room cost $3,648. 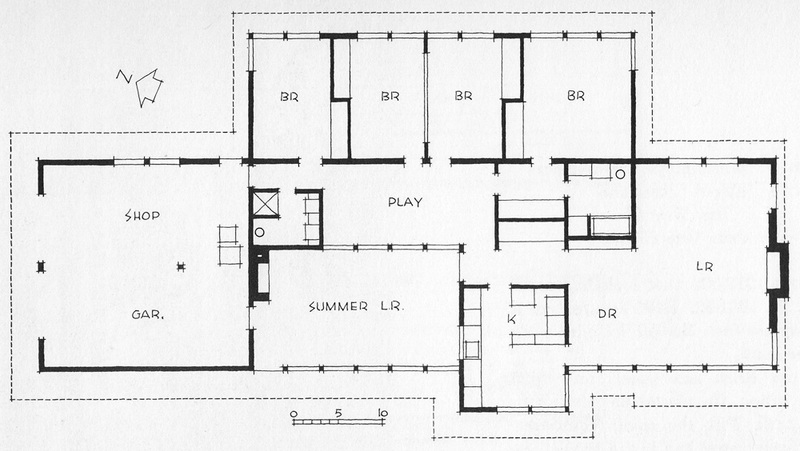 1812 square feet in house at $9 per square foot; 912 square feet in garage and summer living room at $4 per square foot. Materials: Wood frame construction. Built-up wood beams and plank roof and ceilings. Floor slab (on concrete foundation with sub-floor of crushed stone) of concrete poured and machine-troweled, reinforced with radiant ray-duct steel pipes, which allowed elimination of reinforcing mesh. 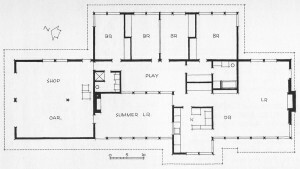 Plan Facts: In order to get much house (with requirement of four bedrooms, two baths, a playroom, as well as a generous living-dining room and kitchen within the under $20,000 budget limitation) the owner, Robert Brown, decided to do much of the building himself under the architect’s supervision. In addition to this amount of space for family living, Mr. Brown-whose hobby is cabinet work-also wanted a workshop, which has been combined with the garage. It developed that by screening roofed-over space between the house and the garage, a summer living room became possible. Opening from the playroom, which in turn opens from the three children’s rooms, this arrangement allows generous space for both child and adult activities away from the living room. 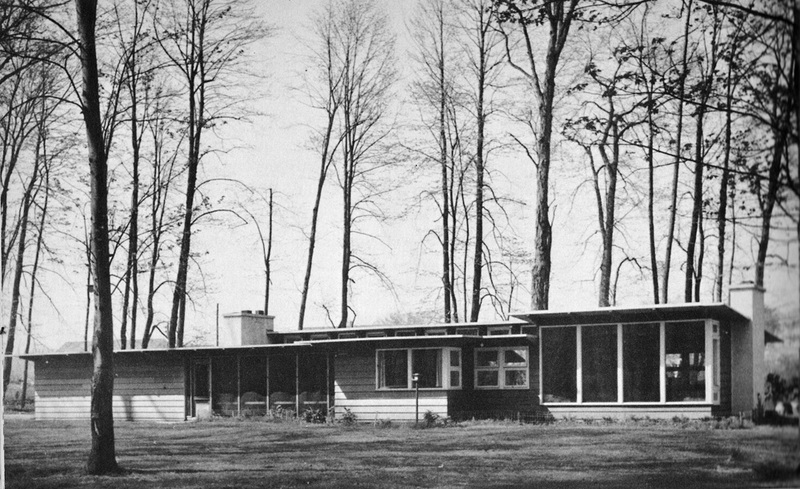 Economies: In addition to the considerable saving through owner-building, there were carefully thought out economies, such as: use of a four foot module construction system; all stock size of materials with minimum cutting and waste; T-beam roofing; and floor slab over crushed stone base. Budget Suggestions: The garage-workshop and summer living room might have been omitted or postponed until a later date.